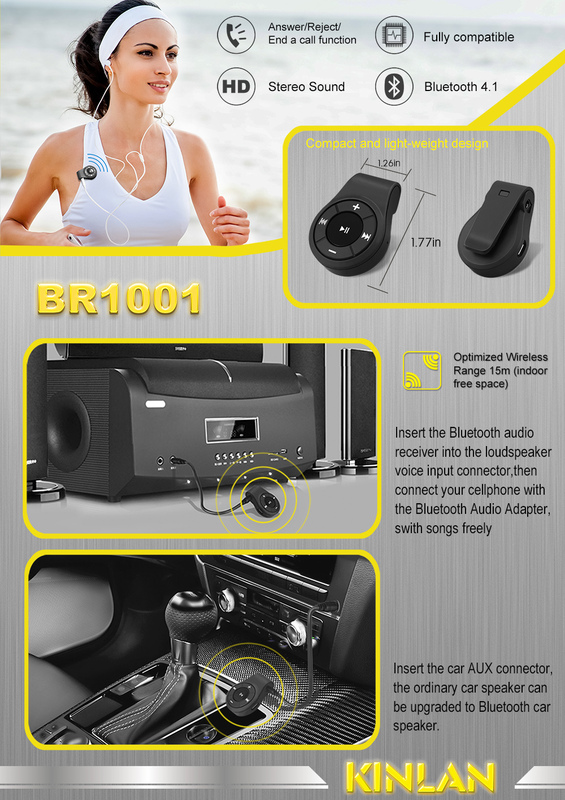 This Bluetooth Audio Receiver connects your wired devices,such as earbuds or headphones,into Bluetooth enabled devices via standard 3.5mm audio jack. Once paired up with your smartphone, tablet,car or other Bluetooth enabled device, it gives your freedom to move around without the inconvenience of tangled wired. Our Service: 1.100% QC inspection before shippment. 2. CE/ROHS listed, competitve price. 3.OEM & ODM: Design and produce products as your request, help you grab market share in your city quickly. FAQ: Q: What's your Payment Method? A: We accept TT, Western Union and Paypal payment in general. Q: If we decide to move forward with our order what is the next step? A: You place order first. Then we will send you PI. After you settle the payment by TT or Paypal or Western Union. We will arrange production for you. Q: Do you have warranty policy? A: Yes, we have. We provide 12 months maintenance warranty.